The waste-to-energy market is slowing down according to new research, which suggests that the commissioning of new capacity will decrease in the UK and across Europe from 2015 onwards. A study from ecoprog GmbH reveals that the UK in particular will be hit hardest as the market becomes saturated. Britain is currently the main stimulus of growth in Europe and compensated the industry when the development of incineration capacities in countries such as Germany and the Netherlands had stopped. After 2015, however, demand from the UK is expected to slow down. The sector is already showing signs of financial woe - a recent review from Eunomia found that consented energy-from-waste plants are struggling to get finance, with the UK sitting on 21.3m tonnes of residual waste processing capacity that has not yet commenced construction. The ecoprog study forecasts that as the UK market tails off, the number of waste-to-energy projects in Eastern Europe will increase. In the medium term, however, these markets will not lead to a new construction volume of the same extent. Throughout the world, there are almost 2,200 waste incineration plants with a combined disposal capacity of about 255 million tonnes of waste per year. By 2017, approximately about 180 plants with a capacity of about 52 million annual tonnes are expected to come on-stream. 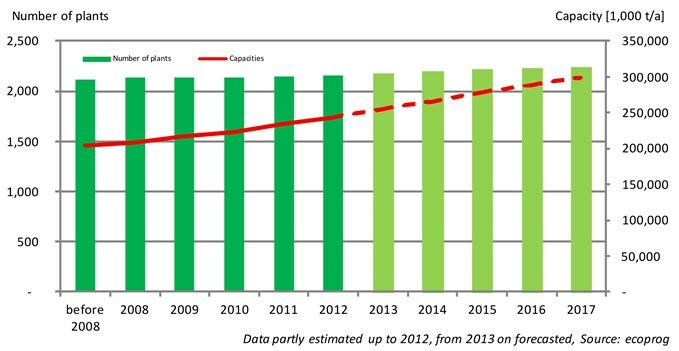 Within Europe, approximately 45 incineration plants with a total capacity of 15 million annual tonnes are forecast to be commissioned up to 2015. After this, commissioning of new capacities is expected to fall from about 3.5 million annual tons in 2015 to less than 2 million annual tons in 2017. Overall, investments in the construction of new incineration plants in Europe will decrease by about 40% to around one billion euros by 2017. In the same year, the market for maintenance and renewals of existing plants will for the first time reach a volume of the same size. According to the study, potential growth markets such as Spain or France will be hampered by limited funds due to the euro crisis and weak pressure to implement the EU Landfill Directive. Outside of Europe, China will remain the most important market in the years to come. In the coming five years, about 125 new plants with a capacity of 40 million annual tonnes are forecast to be commissioned in China each year. Altogether, demand from Europe and East Asia will continue to dominate the world market. Outside of these regions, there is only sporadic demand for disposal solutions in thermal waste treatment and this demand is often limited to individual projects. This also holds also true for the North American waste-to-energy market, where the industry does not expect high investment in modernisation or new construction. Despite high expectations, there is hardly any development in emerging markets such as Brazil, India and South Africa. These countries are experiencing disposal problems, but stable sources of income in the form of waste fees are still missing.